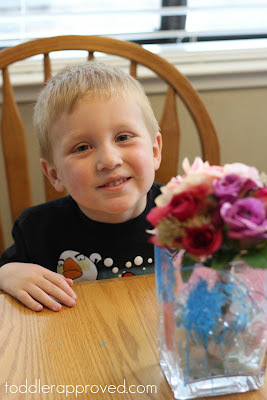 I loved this painted glass tumbler post over at Say Yes To Hoboken last week and have been dying to try a glass painting activity with my preschooler. I was envisioning cute kid-designed tumblers in our cupboard... but I'm still looking for the perfect glass painting set and plain tumblers. In the meantime, we had a bunch of friends over last week and the kids wanted to create. We were talking about how special moms are (the two little friends who were over just got a brand new baby sister and they think their mom is pretty cool). We decided it would be fun to make some crafty Mother's Day vases. Preschoolers love to experiment and create again and again though... so instead of using paint and having them make one permanently decorated vase, we grabbed some Crayola window crayons and started creating! I had no idea how much fun this would be! They were creating again and again for over a half an hour. The beauty of the window crayons is that you can easily wash them off and start over again. I also like the window crayons because they don't really smear when kids are drawing with them and touch the surface. 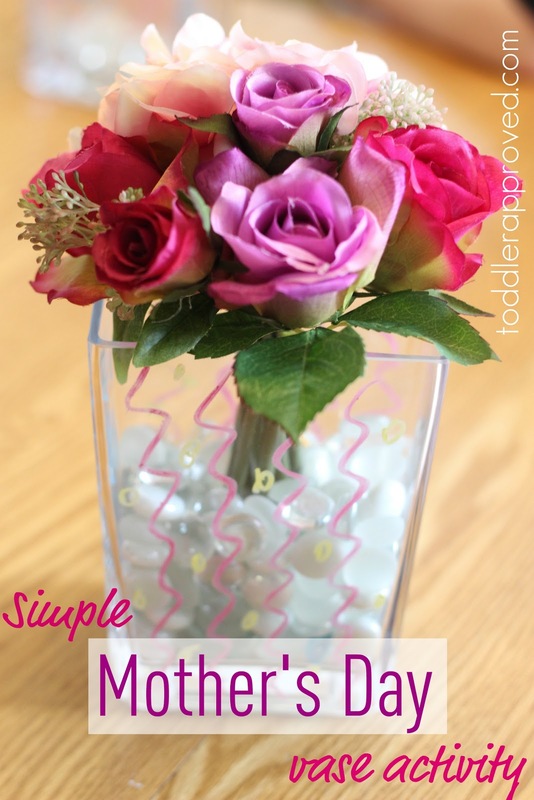 Once each kid was done with their vase, they added some glass pebbles and some fake flowers (though you could easily add real ones)... and voila, they had a special little Mother's Day creation! My little guy was so proud of his vase that it has been sitting on our kitchen table all week! While creating, you can talk about shapes, colors, lines, and different types of designs. There are so many language skills you can embed into this project without feeling like your are teaching your child. Count the lines the draw, practice drawing new shapes and labeling them with new vocabulary words for your child, or even have your child practice writing their name on their vase. Wouldn't it be a fun to give a plain vase, a bouquet of flowers, and a box of window crayons to a special mother or grandmother that you know for Mother's Day? Not only are you giving the gift of a special personalized creation... but you're also giving the mother a fun activity to do with her child/grandchild! Do you have any other favorite Mother's Day gifts you like to give to special mother's/grandmothers in your child's life? Last year we did some Kid-Made Mother's Day Subway Art.